When not undertaking a variety of celebrity duties, Pete has a busy schedule touring with The Pete Best Band. The Pete Best Band captures the sound of the Beatles in their formative years – the early years for many ‘was’ The Beatles. John Lennon summed this up well – “We were at our best when we were playing in the dance halls of Liverpool and Hamburg. The world never saw that.”. When not performing with his band, Pete has a busy schedule, undertaking a variety of celebrity duties. 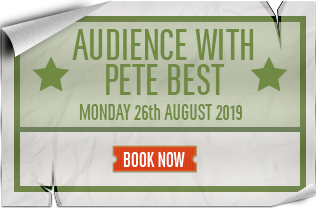 Pete’s appearances include TV & Radio guest, Collectable shows, Beatle conventions, Signing sessions, Opening ceremonies and as a special guest speaker.